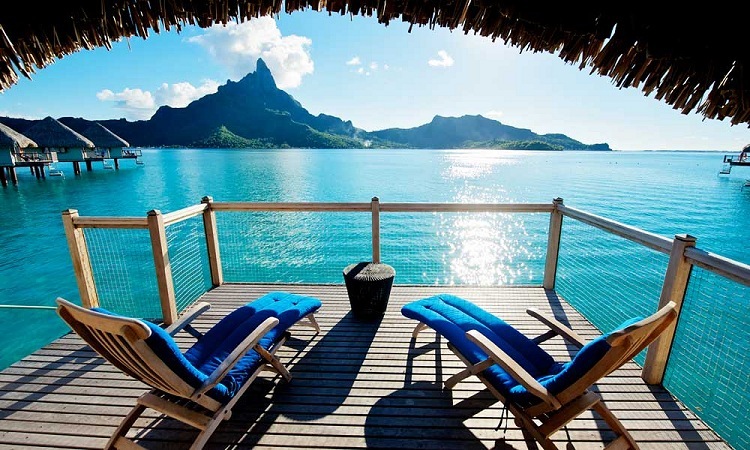 Save $$$ on a 5 Star Bora Bora Vacation! Bora Bora is a small island thick with coconut forests and colorful villages, surrounded by miles of fine, white sandy beaches and crystal clear, turquoise water as far as the eye can see. Don’t just dream about paradise, come and enjoy it for yourself! Now you can go and get a fabulous deal…Stay at the world-class Le Meridien Bora Bora for five nights, featuring 5 star accomodations over the water, great snorkeling, fantastic beaches and days of total relaxiation. Book with Teplis and get a free night, a complementary upgrade, plus airfare, transfers and breakfast every day! Prices start at $3,379 per person, based on double occupancy and current exchange rate. Package price is based on departure from Los Angeles (Please inquire about departures from other cities, single supplements, extensions.) Complementary upgrade from Motu Overwater Bungalow to a Lagoon Overwater Bungalow only. All packages and prices are subject to availability. Airline taxes are included. This incredible offer expires August 31. To book grab your piece of paradise, call Susan in our vacation department at (678) 420-2510, Toll-Free: (800) 950-2950 or email her at vacations@teplis.com today!